Micro RC Boats - Is Bigger Really Better? [caption id="attachment_258" align="alignleft" width="300" caption="Mini Tracer RC Boat"] [/caption] When it comes to RC boats, the best choice all depends on your preferences as well as your budget. Being recently introduced to the model RC boating world, micro RC boats are available in smaller sizes and are now more affordable thanks to developments in RC technology. These models are often intended as toys and they can offer a lot of fun for young kids and adults, alike. They are small enough to run in a small pond or a swimming pool. Two or more RC boats can race one another when the two boats are set to different frequencies. However, the controls for micro RC boats are slightly more simplistic compared to the bigger and more sophisticated models. Despite the affordability, micro RC boats also have their own share of disadvantages. Speed is topmost on the list with power second in line. Because it cannot use nitro or gas engines for power, it offers a shorter play time compared to the bigger models that can use gas or nitro. Most micro RC boats are considered toy-grade. And despite their fast speed, they still cannot outrun those powered by more advanced engines equipped on bigger models. Size really does matter with RC boats. The bigger the boat is, the better it can accommodate a powerful engine. And when you are able to use fuels like nitro or gas, it can run at remarkable speeds on the water. When you have a smaller RC boat, you can only use a smaller engine that is powered by smaller batteries. This may be cost-effective but won’t work if you want to race with other RC boats in a real competition. If you are a beginner, you may find yourself enjoying micro RC boats. 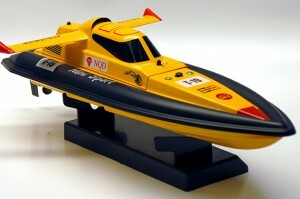 But if you have already tried using the bigger and more advanced models, you may find micro RC boats a little boring. And as for the question “Is bigger really better?” the answer would depend on who will be using the micro RC boat and for what purposes it will serve. As a tip to someone who is unsure about what model and what size to buy, a little research will help you make the right decision. The prices you will find on online hobby stores may differ significantly even if they carry the same models. By doing a little comparison shopping, you will surely come across a great model at a discounted price. Another way to go about making an educated decision is to go to a local hobby shop and ask for some ideas from the RC dealer. Being exposed to a lot of RC brands and types, they should have something to say to help influence your decision. Listen to their advice then weigh the advantages and advantages of each model presented. Only then will you be able to find something that will really satisfy your interest and desire for RC boats.